Where to learn languages in Cape Town? 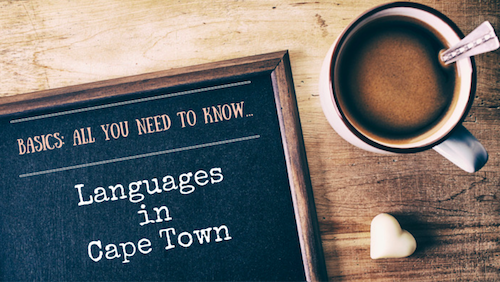 Which languages are spoken in the Mother City? What is South African Slang? Which languages are taught in Cape Town schools? So it is a good idea to familiarize yourself with simple words like 'robot', which stands for 'traffic lights', and 'braai' (others call it 'barbecue') to find you ways around in the Mother City and enjoy your stay in South Africa. The South African public schools and most of the Cape Town private schools teach according to the South African curriculum. So in South Africa's schools the final high school exam after grade 12, the South African Matric, will be written in two languages usually English and Afrikaans, one as home language the other as first additional language. Some private schools as well as the international schools in Cape Town are teaching according to the British, American, German or French curriculum and offer other languages in Cape Town as subjects during class time. Make sure to check your language requirements for later studies to confirm the language requirements when intending to study further overseas at a later stage. In 2016, Mandarin chinese was introduced into the SA curriculum as an additional language as well. If you are expats and live in South Africa for less than 5 years before the matric exam, your child can be exempted from taking the exam in Afrikaans as first additional language and can choose another language which is accepted by the SA examinations board Umalusi. Please always check with the Department of Education and your school to be sure about the current regulations. For the exemption regulations also refer to this letter. It is not common to have other foreign languages than the South African languages taught at the local schools, even internationally popular languages like French, Spanish or German are not taught in many private schools at a regular basis. Even most of the private schools in Cape Town do not have foreign language departments in their schools as you may know them from overseas and often parents are asked to find a teacher for their child to have additional languages taught at school or home at a recognized level and also to get accepted later to have additional language skills tested at Matric level. Cape Town is a popular destination for language studies and choosen as a favourite language travel destination by people from all over the world. Some choose to come here to combine their language studies with some adventure travel, safari travel or homestays to get more insights into the Cape Town life. There are several language schools in Cape Town catering for tourists, business travelers and gap year students offering language classes for exam preparation, business English or immersion courses and some even add on work experience programs. And learning foreign languages in Cape Town can be a lot of fun too. So have a look at my listings below. The different language schools in Cape Town offer all kinds of language learning experiences. The Cape Town language schools are located mainly in the city centre and Sea Point, but you will find some of them in the suburbs too. Class sizes and course prices vary, so you should check out the schools to suit your own requirements. Many of the longer established schools are members of the Education South Africa (EDUSA). Find more information and links to schools for learning languages in Cape Town here. Afrikaans being the most commonly used official language in South Africa next to English which is taught to children in all schools. To complete the South African High School's 'Senior Certificate' or 'Matric', the children usually have to take exams in English and Afrikaans. Learning Afrikaans will give you more insight into the life of the locals and as the language is a mixture of Dutch, English and German vocabulary with some Malay and African languages strewn in, and thus it is quite easy to learn for people knowing any of these languages already. Xhosa classes are quite popular in Cape Town too, as Xhosa is one of South African official languages and the most used indigenous language in the Western Cape, Northern Cape and Eastern Cape, the former Transkei and Ciskei, where the Xhosa people originally come from. Xhosa is spoken widely by local staff and personnel. So it is always a good idea to learn some basics of Xhosa to understand the linguistic and cultural upbringing too. In adult education language classes, the cultural component of language learning usually plays a big role. And you will be surprised how many things you will learn about the right approach, cultural concepts and intercultural communication. Cape Town primary schools teach Xhosa, but in higher classes Xhosa is often only offered to pupils as a complimentary subject. For Xhosa lessons please check out this Xhosa language school. When you want to learn other foreign languages in Cape Town, whether for your job or to get private language tuition for your children or for travel purposes, you might consider the following language schools and courses in Cape Town. •	Learn Spanish in Cape Town: Alliance Francaise in the CBD, Tel: 021-423 5699. Find more Spanish language schools here.